The Victor Adding Machine Company was incorporated in 1918 in Springfield, Illinois. Carl Bueler invested heavily in the company and under his control and then that of his son A.C. Bueler the company was guided to success in the field of low cost, but high quality, add-listing machines. In 1961 the Comptometer Corporation merged with Victor to form the Victor Comptometer Corporation. Victor developed its mechanical calculators which sold into the early 1970s. It was also a pioneer in electronic desktop calculators incorporating integrated circuits, though this was unsuccessful. In the mid-1960s it had contracted with General Micro-electronics, a subsidiary of Philco-Ford, to produce the integrated circuits for electronic calculators. Although prototype calculators were demonstrated, problems involved in mass-producing the chips could not be overcome at the time, and the development contract was dropped in 1968. 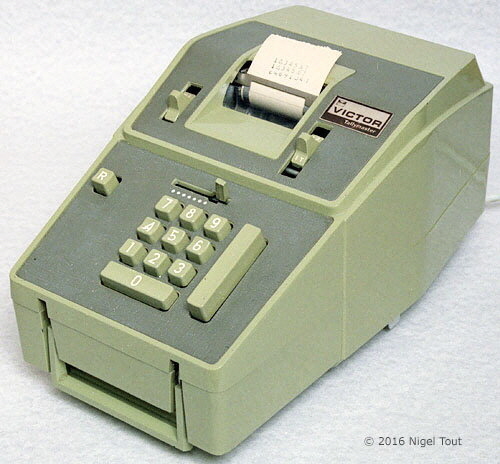 In 1968 Victor contracted with Nixdorf of Germany to market in the U.S.A., under the Victor name, the electronic desktop calculators manufactured by the Nixdorf's Wanderer subsidiary. Hand-held calculators under the Victor name were manufactured in U.S.A., Canada, and Japan. The Victor company is still in the calculator business, after several changes of ownership, as Victor Technology; see https://en.wikipedia.org/wiki/Victor_Technology. This hand-held electronic model, dating from about 1973, was made in Japan for Victor. It is quite large for the year and features a battery-level meter. For further photographs of Victor hand-held calculators see the Calculator Photo Library on this site.